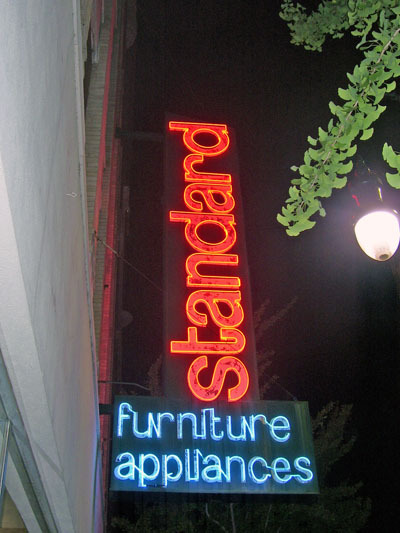 Standard Furniture has been serving Birmingham since 1912, though I doubt this sign dates back that far. It is currently located on the company’s downtown location. This sign appears to help preserve the history of neon along 3rd Avenue North, with the historic Alabama Theatre leading the way. A welcoming site as you’re approaching the Expressway (U.S. 31/280) from the west. There are a few other signs along the street that we’ll take a look at in the coming days. Click here to view the signs covered so far. The event at the Gardens at Park Place that was posted about here will actually be taking place on Saturday, July 15 and NOT Sunday. It just means that those attending the Birmingham’s Hidden Treasures event will have a full day of activities. One more thing… Supposedly you’re resident blogger is the subject of an article in the Urban Living section of the latest issue of Black and White (which is supposed to be hitting newsstands today). Don’t hold me to that since I really have nothing to do with it (except answering some questions). I don’t know what the focus will be, but I’m hoping that I don’t bore people to death. If you see it, post a comment and let us know what you think. Keep it relevant: Lori and the Martins. Previous Post Speak. Drink. Mix. Explore. Change.